There’s just so much talk these days about what can or can’t be done interpreting the Constitution, that it’s as if we had no say at all beyond good old Tom Jefferson’s brilliant mind. But let’s face it, Tom lived in a thinly populated, agrarian society. There wasn’t an actual census taken until 1790, but the best guess is that our fledgling country fledged out at about 2.5 million. White folks, landed folks, but less than 1% of today’s population, in a time of horse-travel and virtually no consciousness of the rest of the world That world was also horse-traveling as best it could. Is a nation that isolated supposed to contain all the societal genes necessary for modern life in this complicated and crowded world? Did I say virtually? That word had a far different meaning in Tom’s day. But how can we seriously ascribe an 18th century interpretation to a word that had not substantively changed its meaning in the 400 years previous to Jefferson, now that we find ourselves computering? Not only computering, but shaving our morning face in Los Angeles and putting an evening smile on it in Paris? Instantly communicating across oceans and continents, not by written word but by miraculously disassembled and reassembled zeros and ones, sent off in multiple directions to be brought together at the touch of a key. A key? Not Franklin’s key, for sure. We are demonstrably no longer Jefferson’s America. Yet we have failed in these past 229 years to uncover another national human treasure even close to his intellect. And here we sit . . . trembling lest we disturb those hallowed words that he and others as fiery as he and as argumentative as he, fashioned in a time the likes of which this country, and possibly the world will not see again. It’s serious stuff and we take it seriously. But we have never taken it as a frozen philosophy, as unchangeable fact, as inarguable truth. Our courts redefine it on a continuing basis, thrashing the nuance out among the best legal minds we can muster and we live with it, die with it, but most of all and to our everlasting credit we change it as the times redefine the very essence of words. 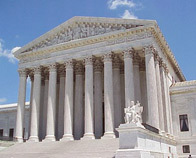 Supreme Court Justices do not give us law. That’s the job, imperfectly accomplished, by State and Congressional legislature. But they interpret those laws and must decide whether laws describing automobiles and nuclear arms and our very rights in an almost irrationally complicated world, can be made to mesh with the gears of our Founders’ minds. It’s a formidable work, but it’s a work constantly in progress. See Taking My Country Personally on my personal web site.